The Jim Thompson House is built on a piece of land which was once part of the vast compound grounds of a summer palace. 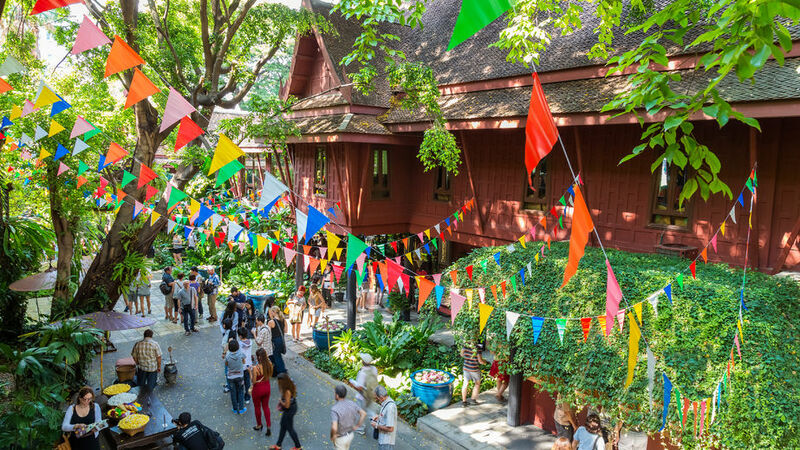 Conveniently situated in the middle of Bangkok, at 6 Soi Kasemsan 2, Rama 1 Road, it has become a world famous museum in honour of its former owner, Jim Thompson. The renowned entrepreneur is known as the “Legendary American of Thailand”. He was the founder of the Jim Thompson Thai Silk Company and received much acclaim as a great contributor to Thailand in his 25-year stay in the Kingdom of Thailand. He was awarded the Order of the White Elephant, a decoration bestowed upon foreigners for exceptional service, for his contribution to the Thai Silk industry. In 1967, while on a holiday trip with friends to the Cameron Highlands in Malaysia, he set out for a walk in the surrounding jungle and never returned. Thus, began the legend of Jim Thompson. Since his disappearance in 1967 little has changed in his home, known as the city’s ‘most celebrated social centre’. 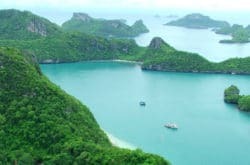 Today it has become a key stop for visitors to Thailand. The house consists of no less than six Thai-style teak structures which were bought from several owners around Thailand and brought to their present location in the 1950’s and 60’s. Thompson was a great collector of South-east Asian art, and the house was originally built to showcase his great art collection. The collection consists of Buddhist and secular art which he brought back from trips to Burma, Cambodia and Laos, as well as local artworks. The drawing room, which is the oldest part of the main house, is an early 19th-century house from the silk weaving village of Ban Krua across the Klong (canal). The kitchen is the next oldest part of the house and was also brought from the weaving village. It dates back to the middle 19th century and was reconstructed from part of an old palace 50 years before. 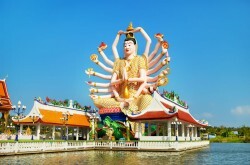 The remaining structures of the house were mainly collected upriver from Bangkok from the province of Ayutthaya, carefully dismantled and loaded on barges to transport them to their current location. The central location of the house makes it easily accessible by car, taxi, tuk-tuk or Sky Train. The Jim Thompson House entrance fee is 150 baht, for students (under 22 years) it is 100 baht. This fascinating museum with its traditionally styled architecture opens between 9am and 6pm daily and is a destination not to be missed when visiting this beautiful and enchanting part of the Thai capital city.